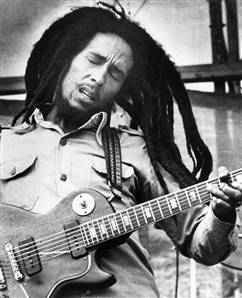 The greatest singer, songwriter, and cultural figure in Jamaican history, Bob Marley brought the righteous message and “positive vibrations” of reggae music to the world, and is the only towering figure of the rock era not from America or the U.K. Marley and his band, the Wailers, created transcendent music around the entrancing, inverted reggae beat and unforgettable melodies that equally decried poverty and injustice and celebrated physical and spiritual ecstasy — all of it grounded in Marley’s abiding Rastafarian faith. Marley’s influence is so pervasive, his music so seductive, and respect for him so great throughout the world that it is easy to forget the beliefs and customs of the Rastas are rather, in a word, odd: reverence of Emperor Haile Selassie I of Ethiopia as a living god who would lead the oppressed black diaspora back to an African homeland (rather more difficult after he died in 1975), smoking the holy herb of enlightenment, ganja (marijuana), as daily sacrament, growing their hair in dreadlocks. Marley was born in rural St. Ann’s Parish in 1945 to a middle-aged white father and a teen-aged black mother, and left home for the tough Trench Town slum of Kingston at 14 in order to pursue a life in music. There he became friends, and formed a vocal trio, with Peter Tosh and Bunny Wailer. They called themselves the Wailing Wailers, later shortened to the Wailers. They worked within the prevailing musical styles of the time, first the buoyant up-tempo ska, then the slower sinuous rock steady, which then gave way to reggae. The Wailers' first albums for Island, “Catch a Fire” and “Burnin’” (both '73), became instant classics and introduced “Stir it Up,” “I Shot the Sheriff,” and Tosh’s “Get Up Stand Up” to the world. Tosh and Wailer then both left to pursue solo careers and the Wailers became Marley’s vehicle of expression. Until his tragic death from cancer at the age of 36 in 1981, Marley generated anthem after anthem and brought hope and pride to the Third World, in addition to touching hearts and moving feet across North America and Europe.